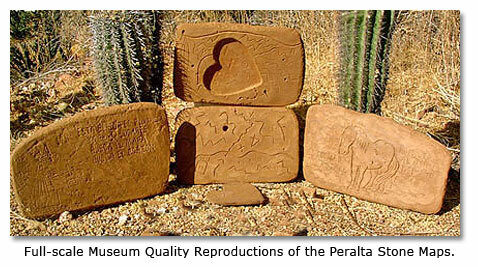 Some people think that dating the Peralta stone maps should be a simple procedure of applying modern science to determine their age. Dating the stones themselves would in fact be quite simple using the potassium-argon method described below. But the results would only indicate how long ago mother earth formed the rocks that the stone maps were made from millions or billions of years ago. The question is really when were the inscriptions carved into the stone maps? One way of finding the answer to this question might be to analyze organic materials deposited in the grooves of the inscriptions after they were cut. Since we are concerned with organic materials you might jump to the conclusion that the radiocarbon method (described below) could be used for doing this. Unfortunately it will not work on the stone maps because the radiocarbon process is only accurate on items between the ages of approximately 600 (10% of the halflife of carbon 14) and 6,000 years old due to standard statistical deviation in the rate of decay and halflife of carbon 14. The radiocarbon dating method could supply useful information about the age of any organic materials in the inscriptions on the stone maps only if the inscriptions on the stone maps were over 600 and less than 6,000 years old. If this could have been done immediately after the stone maps were found, it might have produced useful information. Since these maps have been handled by an unknown number of people in an unknown number of different conditions, and known to have been transported all over the country under unknown conditions, there is no possibility of gaining any useful information about the age of the inscriptions on the stone maps by any known radioisotope method of dating at this point in time. The stone map inscriptions may have contaminated by foreign material from any time period in history. In addition the stone maps are not believed to be 600 years old, so they don't meed the first criteria for radiocarbon dating. There's only one method that could possibly determine the age of the inscriptions on the stone maps – and that's an indirect method. If it's determined where they lead and artifacts are discovered there that could be linked indisputably to the stone maps, those artifacts themselves could be dated. 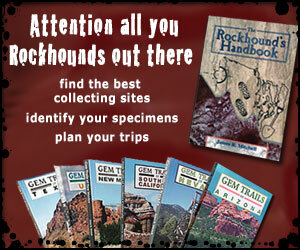 Find the mines or the treasure they refer to, and you may have a chance to find out when the stone maps were created. Short of that, the debate over the age of the stone maps will most likely never end. All Rights reserved, no part of this document may be reproduced or copied in any form or by any means graphic, electronic or mechanical, including photocopying, recording, taping, or retrieval systems without the written permission of Jim D. Hatt. One of the most widely used and well-known absolute dating techniques is carbon14 (or radiocarbon) dating, which is used to date organic remains. This is a radiometric technique since it measures radioactive decay. Carbon14 is an unstable isotope of normal carbon, carbon12. Cosmic radiation entering the earth’s atmosphere produces carbon14, and plants take in carbon14 as they absorb carbon dioxide. Carbon14 moves up the food chain as animals eat plants and as predators eat other animals. With death, the absorption of carbon14 stops. This unstable isotope starts to break down into nitrogen14. It takes 5,730 years for half the carbon14 to change to nitrogen; this is the halflife of carbon14. After another 5,730 years only onequarter of the original carbon14 will remain. After yet another 5,730 years only oneeighth will be left. By measuring the proportion of carbon14 in organic material, scientists can determine a fossil’s date of death. However, because the halflife of carbon14 is short, this dating technique is less dependable for specimens older than 40,000 years than it is for more recent remains. A further issue is known as the "Old Wood" problem. Particularly in dry, desert climates, it is possible for organic materials such as dead trees to remain in their natural state for hundreds of years before people use them as firewood, after which they become part of the archaeological record. Dating when that particular tree died does not necessarily indicate when the fire burned. This is also true of the heartwood of a tree, which will appear younger than the outer rings of the same tree because it has had less time to incorporate carbon-14 into its makeup. For this reason, many archaeologists prefer to use samples from short-lived plants (such as weeds or crops) for radiocarbon dates. The development of AMS (accelerator mass spectrometry) dating, which allows a date to be derived from a very small sample, has been very useful in this regard. Other radiometric dating techniques are available for earlier periods. One of the most widely used is the Potassium-argon_dating (K/A) technique. Potassium40 is a radioactive isotope of potassium that breaks down into argon40, a gas. The halflife of potassium40 is far longer than that of carbon141.3 billion years. With this method, the older the specimen, the more reliable the dating. Furthermore, whereas carbon14 dating can be done only on organic remains, K/A dating can be used only for inorganic substances: rocks and minerals. Potassium40 in rocks gradually breaks down into argon40. That gas is trapped in the rock until the rock is heated intensely (as with volcanic activity), at which point it may escape. When the rock cools, the breakdown of potassium into argon resumes. Dating is done by reheating the rock and measuring the escaping gas. We have started an new section for posting replies to this and other articles. You can post pictures and edit your posts, this will be easy for you to use. Click here to go to the new sections. Joshua Tree National Park - Black Eagle Mine Road Video - Beginning 6.5 miles north of the Cottonwood Visitor Center, this dead-end dirt road runs along the edge of Pinto Basin, crosses several dry washes, and then winds up through canyons in the Eagle Mountains. The first 9 + miles of the road are within the park boundary. Beyond that point is BLM land. Several old mines are located near this road. Randsburg, California is located southwest of Ridgecrest, just off of Highway 395. Gold was first discovered here in 1895 at the Yellow Aster Mine. The mines of the area have produced over one million ounces of gold. Today the gold mining activities have been replaced by tourists shopping for antiques, part-time prospectors, and off-roaders looking for food and a rest stop.